BBC NEWS | UK | Will police now shoot to kill? Will police now shoot to kill? A Muslim group has said it is concerned there is a new police "shoot to kill" policy in the UK following the shooting dead of a man in south London. The Muslim Council of Britain said it was getting calls from Muslims who were "distressed" about the incident at Stockwell Tube station. Roy Ramm, former Met Police specialist operations commander, said the rules for confronting potential suicide bombers had recently changed to "shoot to kill". One terrorism expert said if the shooting was carried out by police - rather than special forces - it would represent a "pretty big departure" for the UK force. Professor Michael Clarke, professor of defence studies at King's College London, said the officers who carried out the operation in south London were unlikely to be police. "These guys may have been some sort of plain clothes special forces," he said. "To have bullets pumped into him like this suggests quite a lot about him and what the authorities, whoever they are, assumed about him. "The fact that he was shot in this way strongly suggests that it was someone the authorities knew and suspected he was carrying explosives on him." He added: "You don't shoot somebody five times if you think you might have made a mistake and may be able to arrest him." Prof Clarke said police officers were not trained to carry out operations in this way. 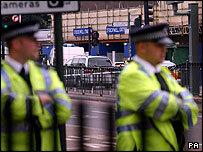 "Even Special Branch and SO19 (Scotland Yard's armed unit) are not trained to do this sort of thing. "It's plausible that they were special forces or elements of special forces." Mr Ramm said the danger of shooting a suspected suicide bomber in the body was that it could detonate a bomb they were carrying on them. "The fact is that when you're dealing with suicide bombers they only way you can stop them effectively - and protect yourself - is to try for a head-shot," he said. 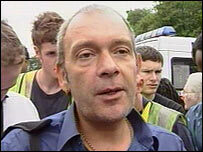 Former government intelligence analyst Crispin Black agreed there was no other way of stopping someone who was an "immediate threat to life". "It implies that the police knew who he was, it also implies that they considered him an immediate threat to life, under which circumstances they must try and kill somebody...you must shoot to kill." But MCB has urged the police to explain why the man - said to be of Asian appearance - was shot dead. Spokesman Inayat Bunglawala said Muslims he had spoken to this morning were "jumpy and nervous". "I have just had one phone call saying, 'what if I was carrying a rucksack?'. "There may well be reasons why the police felt it necessary to unload five shots into the man and shoot him dead, but they need to make those reasons clear," he said. "We are getting phone calls from quite a lot of Muslims who are distressed about what may be a shoot to kill policy."